Mum knows best, so let her decide! From Baby Prams, Cots, Pushchairs, Car Seats to Nursery Furniture and a lot more. A Gift Voucher is the ideal present for that new born baby. 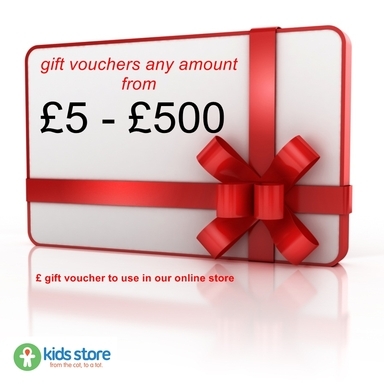 You can buy a Gift Card of any amount between £5 and £500 by submitting your details in the form below. We can deliver the gift card via Royal Mail to the recipient with a small extra cost or we can email it to the recipient with no extra cost or to you directly so you can print it and give them personally. First submit your details and the recipient details in the form below and then Add to basket the desired amount. You can decide the Date that the Gift Card is emailed on so it will arrive at the right time. P.S: Gift Cards do not expire. Choose the amount you want for the Gift Card, Add to basket and then proceed to checkout.